This version of the photo that has been circulating online has been doctored to cross out China’s ‘nine-dash line’. A photo of Chinese tourists wearing T-shirts depicting Beijing’s disputed claims to the South China Sea has sparked anger in Vietnam. The shirts featured a map of China and its so-called nine-dash line — the self-declared sea boundary covering nearly all of the disputed waters. The territorial dispute is a hot-button issue in Vietnam, which has a long history of conflict with its much larger neighbour. Unlike the current administration in the Philippines, the Vietnamese government has been unflinching in the face of increasing Chinese expansionism. The group of about 10 Chinese tourists arrived at the Cam Ranh airport late on Sunday (May 13) and were stopped by security at the immigration desk, an airport worker told AFP. “We asked them to take the T-shirts off before allowing them to leave the airport,” he said. 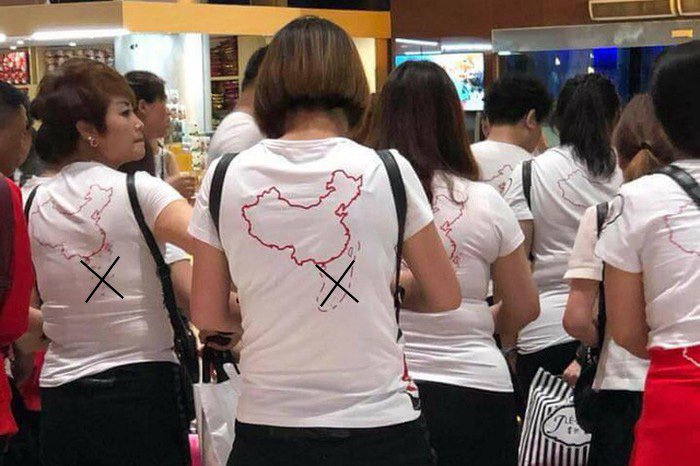 Photos of the tourists and their T-shirts have spread like wildfire on social media, with many doctored to cross out the Chinese claims. Other voices have demanded the group is sent home. “Immediately deport them and ban them permanently from coming to Vietnam,” Facebook user Nguyen Ngoc Hieu wrote. This is not the first time the maritime dispute has trickled into the tourism sector. As we reported in 2016, a Chinese passport featuring a map of Beijing’s sea claims was defaced by a border agent in Ho Chi Minh City’s airport with a handwritten note adding “F**k you”. Some border officials have even refused to issue visa stamps in Chinese passports with maps of the nine-dash line. Also, in 2014, a Chinese couple were caught trying to bring a stack of maps showing the ‘nine-dash line’ into Vietnam. Meanwhile, the US clothing retailer Gap has apologised for selling T-shirts with what it calls an “erroneous” map of China that didn’t feature Taiwan or the South China Sea. In a post on China’s Weibo microblogging platform, the company said it discovered that some T-shirts sold overseas “had an erroneous design of China’s map”. “We are truly sorry about this unintentional mistake,” Gap said.